Cabinet rejects DM's plan for harsh action in Gaza, opting for PM's line of responding in light of developments on the ground. Netanyahu takes army's position. With Eizenkot and Liberman. 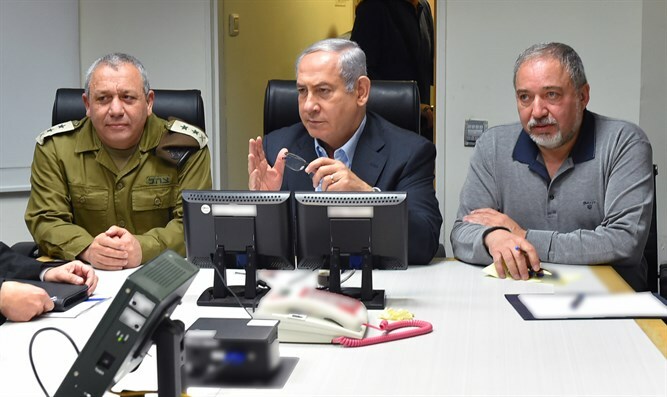 The political-security cabinet decided during the long meeting last night to adopt the line led by Prime Minister Binyamin Netanyahu, and to support a military response only on the basis of developments on the ground and not on a proactive basis. During the meeting, Defense Minister Avigdor Liberman presented a plan to initiate a harsh response against Hamas. At the same time, the IDF, with the encouragement of Netanyahu, presented another plan whereby response would be according to what was happening on the ground and only if the terrorist organizations tried to attack Israel. The cabinet ministers were instructed not to be interviewed by the media about the discussion in question, which also dealt with the indirect talks sponsored by the United Nations and Egypt vis-a-vis Hamas in Gaza to restore relative calm to the area, as was seen until March 29 this year. Liberman, even before the discussion, said that the process of indirect contacts for calm had failed, despite repeated attempts. However, the cabinet did increase the army's scope of action in response to violent demonstrations near the fence in Gaza, and also authorized more severe action against those who launch terror balloons. The implementation of these directives is due to take place tomorrow, when thousands of violent rioters are expected to convene along the Gaza border. Member of the political-security cabinet Minister of Construction and Housing Yoav Galant (Kulanu), spoke Thursday about Israel's intended response to the security escalation in the south. "I will not refer to the content of the cabinet discussions, but I can say one thing very explicitly - the rules of the game are about to change," Galant said. "We will no longer accept the arson terror and the fence terror," added Galant, who is currently taking part in a conference of the Association of Contractors and Builders in Eilat.